I’m not sure how dexterous the average kid is with a whisk, but mine tend to fling whatever they are mixing everywhere. Cooking with the kids in my house doesn’t tend to be a neat affair; perhaps I could make the workspace a little more professional with kitchen accessories for kids from Curious Chef. Wrestling with a huge wooden spoon or peering over the edge of a huge mixing bowl is a thing of the past with gear from Curious Chef. 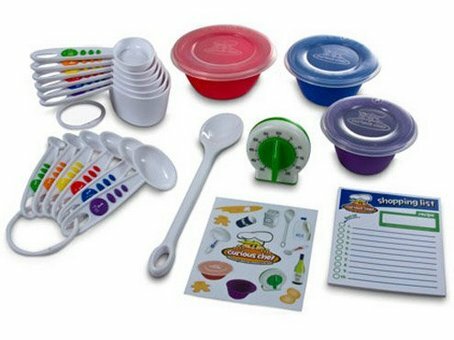 There are forty-nine utensils in the Curious Chef range, all uniquely designed for little hands. Expect to see small versions of practically everything you have in your own collection of kitchen tools – from basic silicone spatulas to lemon zesters, nylon pizza cutters and fantastic plastic knife sets. I particularly like the Measure & Prep kit (shown above). Apart from the fact kids love measuring out ingredients, the little prep bowls are great for demonstrating that a bit of work goes in to making a meal. 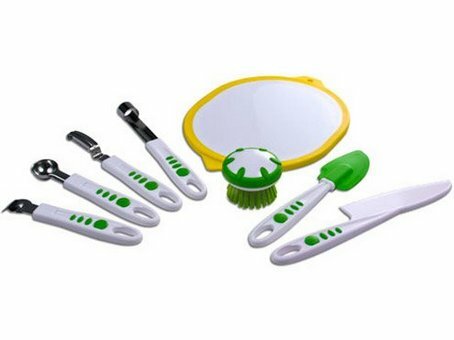 The Measure & Prep Kit is US$19.99 and the three-piece knife set is US$8.99. Buy online at Creative Kidstuff, which ships to Australia.